Home > Blog > Is Tamiflu For You? In early March of this year, I got really sick. It was the worst illness I've ever had. I started the day feeling a little "meh," and everything went downhill from there. I wasn't throwing up or anything, but my asthma kicked into high gear. I was achy and was running a hefty fever. As nighttime approached, breathing became very difficult, and my inhaler just wasn't helping. I decided to try to steam my lungs open because it felt like my bronchial tubes were nearly sealed shut from either inflammation, mucous, or both. As I sat in the shower, panic started to set in, which is the worst thing to let happen when you're having an asthma attack, and I found myself clawing at the walls of the shower, attempting to use them for leverage to catch my breath. I thought, "I may need to have Amanda call an ambulance because I think I'm going to pass out." Luckily, my quick-thinking wife made me a stiff cup of coffee and the caffeine, combined with the steam of the shower opened up my lungs enough to receive the medicine in my inhaler. I made it to bed only to wrestle with the most bizarre, LSD trip-strength fever dreams. The one I remember most vividly was that I was a 2x4. Yep, I had a dream that I was a plank of wood. Only, I was sort of awake, but felt paralyzed and wanted to wake up my wife because...I was paralyzed, but I couldn't because...I was paralyzed or rather, I was a 2x4. It was strange. When I woke in the morning, the dreams and fever were gone but my breathing trouble was back. My wife dropped the kids off at her parents' house and drove me to the urgent care facility. I felt so weak and could feel panic starting to set in again. Fortunately there wasn't a long list of waiting patients, so I was able to get in quickly. They gave me a breathing treatment that opened things up again and swabbed my nose to test for the flu. The flu test came back positive, so they prescribed me Tamiflu for the Influenza A and a steroid to open up my breathing. The doctor explained that Tamiflu wasn't going to instantly make my flu go away, but it could "shave a day, maybe a day and a half" off of my down time. I was skeptical, but thought I would see how much the Tamiflu was. I meant to tell my wife before she went into the pharmacy not to get the Tamiflu if it was too expensive, but I was wiped out and forgot. It turns out that after our insurance, the cost was still $100 for five (maybe 7) pills. I was not happy. I was even less happy when I started taking Tamiflu, and even less happy after I started to research the drug that I was taking. Tamiflu is sort of a nifty drug in its design. In the raw pill form, it does nothing. It's not until the drug reaches your liver and is metabolized that it turns into anything that fights the flu. What it's designed to do is attached to cells in a way that inhibits virally infected cells from releasing new bits of virus that would infect other cells. This is supposed to halt the reproduction cycle of the flu virus, thereby curtailing the infection. That's what it's supposed to do. The problem is, it takes its own sweet time in accomplishing this, if it does accomplish it all. Originally it was thought that Tamiflu could help prevent flu complications such as pneumonia. Unfortunately, subsequent studies found that this is not the case. They also found that Tamiflu is only mildly beneficial, and only if it's taken within 24 hours of the flu becoming symptomatic. So, if you decide to tough it out for a day or so, as I had, you might as well save your $100+. I talked with a friend, Karen, who went through a similar ordeal. "Right around the time that swine flu was going around, that crazy flu virus that everyone was freaking out about, I came down with a doozy of a flu," Karen told me. "It was the worst one I've ever had. I was wiped out big time, and of course I was nervous about [the swine flu]. The doctor ended up prescribing Tamiflu, but she told me that it was very hard to get because so many people were hoarding it in case there was an epidemic flu and no one could get Tamiflu." Unfortunately, Tamiflu is not a miracle drug. Study after study has shown mediocre benefits at best, and more studies have shown that Tamiflu doesn't finish the job at stopping viral reproduction. "[The doctor] was telling me about the dangers of taking it because if your body is used to taking it for like a minor flu, if you did get a very strange strain [of flu], it might not work for you," Karen shared with me. "The strain might mutate and the Tamiflu might not be effective in combatting it." That's exactly what the CDC does not want, so they recommend physicians only prescribe Tamiflu in extreme cases such as people who have to be hospitalized because of the flu. They're afraid that instead of Tamiflu being a cure-all, it will create the ultimate super flu because influenza strains can adapt to avoid treatments like Tamiflu. Instead of scrapping Tamiflu as an ineffective treatment, scientists have been doing trials to test different dosage levels of Tamiflu and prescribing Tamiflu in combination with other drugs such as renal inhibitors that keep Tamiflu in the system longer, thereby increasing the concentration of the drug in the body. Where did they get the idea for these Tamiflu treatments? 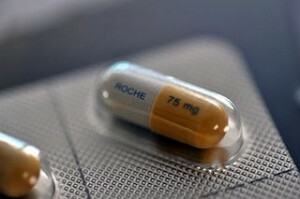 Yup, Hoffman-La Roche, the parent company of the companies that manufacture and market Tamiflu. In 2005, several countries, including the United States, began stockpiling Tamiflu in preparation for a possible flu pandemic, which triggered a production shortage. Everyone wanted this miracle flu drug. They just didn't know yet that it didn't work as well as promised. When I started taking Tamiflu, I started feeling even sicker, so I hopped online to look into exactly what I was putting into my body and to see if there were any contraindications. I was more than a little miffed to learn that, according to the home page of the Tamiflu website, the most common side effects of Tamiflu include nausea and vomiting. It drives me crazy when companies market drugs whose side effects are as bad, if not worse, than the original condition, but here is a drug that has the same side effects of the symptoms of the disease that it's supposed to treat. They might as well say, "Side effects may include complete ineffectiveness of treatment." That's exactly what happened in my case. The Tamiflu didn't seem to work at all. Of course, I can't be sure that I wouldn't have been sick "a day, or day and a half" longer if I hadn't taken the Tamiflu, but I can't be sure that if I had eaten an entire box of Gobstoppers in the same amount of time that I wouldn't have improved more. Karen had the same result. She told me, "I remember I took it the whole time and I didn't get better until the last day of the prescription and I remember thinking, ‘You know what? I bet you that prescription didn't help me at all. I bet the flu just finally worked its way out of my body.' It was just so many days later that I was like, ‘Seriously? Did that even work?!'" As it turns out, Karen and I may have been lucky. Tamiflu side effects include allergic reactions, rashes, Stevens-Johnson syndrome (which is really nasty and can kill you), and hepatitis! Simply put, Tamiflu is still around because it's still profitable. At the height of flu pandemic scares, Tamiflu rakes in hundreds of millions of dollars, and despite some countries making generic Tamiflu, Tamiflu is under patent protection until 2016, so in the U.S., Hoffman-La Roche has no competition. There isn't conclusive evidence that says that Tamiflu is completely ineffective and you sort of get the feeling that Tamiflu is still prescribed because it's the only post-infection treatment around. Flu vaccines are somewhat controversial, so the medical community is reluctant to give their only viable treatment option the old heave-ho, but study evidence of its poor results coupled with the fact that more flu strains are showing resistance to the drugs, and personal experiences like mine and Karen's all seem to suggest that's exactly what they should do. Jonathan Fashbaugh writes for Off-Topic Media. Many thanks to Karen Micallef of The Michigan Center for sharing her experience with us.